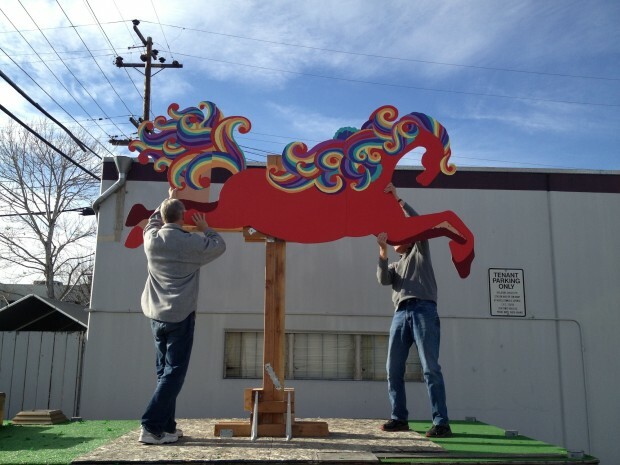 Chinese New Year Float Building – The Flying Horse Takes Shape! With the help of plywood, paint, creativity, and the hard work of the ISTP community, a spectacular flying horse came to life this past weekend. The horse, sporting a bright red coat and rainbow mane and tail, will be the centerpiece of ISTP’s Year of the Horse parade float. This is the 14th year in a row that ISTP will have a float in the San Francisco Chinese New Year Parade, which is recognized as one of the top 10 parades of its kind in the world. Each year, float construction is a special labor of love for our community. Our floats are always created entirely by enthusiastic parent, student, and alumni volunteers. PTA President and Chinese New Year Parade Chair Gary Meeker is a veteran float builder, and offers a unique perspective on the process. “I’ve often said that parade weekend is one of the most enjoyable but also most exhausting of the entire year. This year looks like it will be no exception. Each year, we run into some issue in the float build that requires us to rethink our plans and move to a plan B (or C or D) as the clock ticks down. Inevitably, the team steps up to make it happen! As we approach the final build weekend, all of the pieces seem to be coming together. Our flying horse is amazing and just pops to life with color! The support structure for the horse is 5 times stronger than we had originally imagined. Should the Bay Bridge need any extra support, we’re ready to go. Dave and Lori’s living room was again the scene of activity as the 7-ft diameter globe came to life in papier mâché. Todd’s shop is filling with ever more parade stuff, but this weekend will be the first time we see all of the pieces come together. I’m really looking forward to it! New and cool this year is the “horse cam” with a live video feed direct from the horse’s mouth. Hopefully the technology will be cooperative! I’m also holding my breath to see if we got a TV slot this year. In theory, we shouldn’t but you never know!!! Come see the flying horse float in action on the streets of San Francisco! Join us at the parade on Saturday, February 15th. Contact cnyparade@istp.org for more information and to reserve you bleacher seats and banquet tickets. Take a look at this video for some highlights of the float building so far.